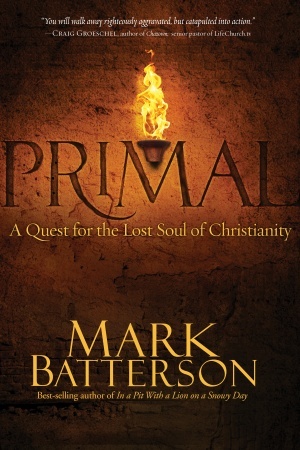 I’ve read Mark Batterson’s other two books, and his newest book, Primal, is a masterpiece as well. Batterson has a remarkable way of communicating a deep truth in a way that we can all identify. Over the last two thousand years, Christianity has evolved in lots of ways. We’ve come out of the catacombs and built majestic cathedrals with all the bells and steeples. Theologians have given us creeds and canons. Churches have added pews and pulpits, hymnals and organs, committees and liturgies. And the IRS has given us 501(c)(3) status. And there is nothing inherently wrong with any of those things. But none of those things is primal. And almost like the Roman effect of building things on top of things, I wonder if the accumulated layers of Christian traditions and institutions have unintentionally obscured what lies beneath. the primal essence of Christianity? Mark Batterson challenges us to get back to the roots of our faith. What is it that Christianity is all about? What do we really believe and why? What are we passionate about? This book will absolutely challenge you to evaluate your faith, and will ultimately help facilitate a revolution in your life. You can buy it here, at Amazon.com.